About Dr. Sandra Clark | Psychologist | Providing assessment, treatment, and consultation services. Dr. Clark has been providing psychological services for over 15 years. She provides assessment, treatment, and consultation services to children and adolescents. She also provides support to parents around a number of issues including parenting and behaviour management. Dr. Clark’s speciality is in providing comprehensive psychological assessments that evaluate multiple factors of cognition, learning, social and emotional development, and parenting and family issues. Her area of expertise is in the assessment and treatment of anxiety disorders, including phobias and OCD. Her work is based primarily on cognitive-behavioural therapy as well as mindfulness-based approaches. Dr. Clark is also a staff psychologist at B.C. Children’s Hospital where she provides services to children and teens with mental health issues. She does presentations and education for physicians, teachers, counselors, parents, and others on anxiety disorders and the impact on family and school functioning. She is the co-author of the Taming Worry Dragons treatment program for anxiety. The guiding principles of Dr. Clark’s work include providing services that are based on current relevant research, best practice standards, goodness-of-fit, and she believes that a supportive, understanding, and collaborative relationship with clients is essential. 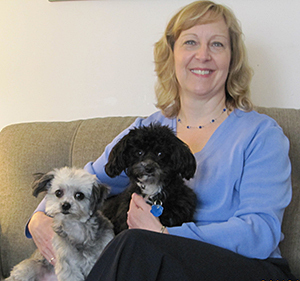 Benjie and Bailey are a regular addition to her office and assist in providing therapeutic support to clients. They stay under her desk – in a cage and only come out when and if children and teens want. They are non-shedding and hypo-allergenic. CACBT-ACTCC Certified in Cognitive Behavioural Therapy. #101 - 3309 Dunbar St.